Last month I wrote an article on the Cliqz browser. Cliqz is a privacy browser which does not track you (like Google's Chrome does), or sell its information on you. Furthermore, it comes with security features built in, like an excellent ad-blocker and anti-tracker. However, if you still use Google, or Bing, or Yahoo, as your search engine, your searches are being recorded and sold. So now I'm doing an article on my favorite privacy search engine that will not sell your information or track you, but keeps your searches private. Qwant is a French Search engine that supplements their own search results with results from Bing. 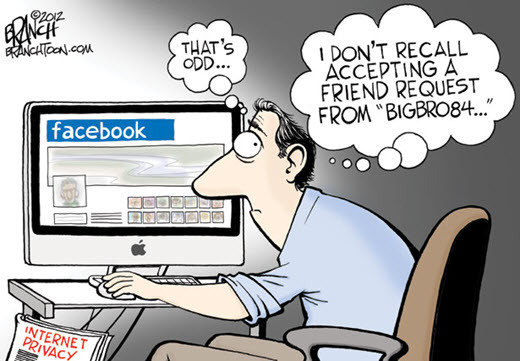 It was started in 2011 with security and privacy in mind and does not track you. It processes over 10 million requests per day and has become my favorite search engine. It gives me great results and is visually very pleasing. They let you filter the results by these categories: web, news, social, images, videos, shopping, music, or boards. Boards are their own social media thing, mostly in French and I couldn't figure them out. This column gives you a normal web search. They do an excellent job. Images: An excellent image search. I get better results from this than from Google's image search. Videos: An excellent video search. Any of the 6 major categories of search can be selected and some offer refinement options. News lets you sort by relevance or most recent. Perfect for finding information about recent events. Images let you filter by size, license or sources. License is very important for me, so I can choose pictures licensed for commercial reuse in my Newsletter. This way I know I'm not violating someone's copyright. Videos allow you to order by Relevance, Number of Views, or Most Recent. Relevance weights newer videos higher. 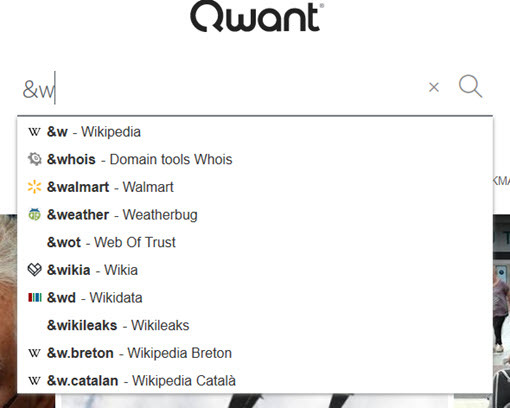 You can configure Qwant to open to any of the search options. You do not need to see all the different types of search results at once. Their home page offers a search button as well as top news stories. This image shows me starting a quick search with &w. It shows the particular places I can search from. The Whois domain tool and Wot are excellent sources to check out a domain. All of these specific search engines and hundreds more can be accessed directly from Qwant. 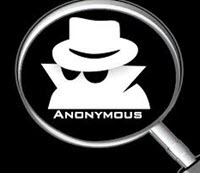 Qwant is not the only privacy search engine. Here are some others. QwantJunior.com: Qwant provides a beautiful private search engine designed for children 6-13. Certainly worth a look if you have children in that age range. Startpage: Is an excellent Dutch privacy search engine that strips out your information and then gets search results from Google. It is really a Private Google search engine. It is an excellent option for those who like Google's search. Before I found Qwant, this was my search engine of choice. DuckDuckGo: Is a very well respected and long standing privacy search engine. It offers its own results but supplements them from Bing and Google. However, in my personal experience, with the things I search for, it is not as good as Startpage or Qwant. Your results might vary because you might search for different things, so give it a try. There are very good alternatives to using Google and Bing as your search engines. These will normally give you as good or better results without compromising your privacy. Give them a try and expand your horizons and your privacy.